After four miles last night (3 miles speed + warmup and cool down) my Adrenalines are officially retired. These beautiful shoes got me through my first half marathon and I love them. I had planned to donate them when my local running store was doing a drive, but I am not ready to say goodbye. How stupid is that? They’re just shoes! (But they’re MY HALF MARATHON SHOES!!!!). I’ll miss running in you. As in pain awesome as speedwork always makes me feel, I almost didn’t go for a run last night. Yesterday was my first day back to work and it was *quite* a day. I love my job but after 10 days off things were bound to be kind of crazy. I’m glad I went back on a Thursday … loving that the weekend is almost here! By the way, I am hiring on my team at work. If you know anyone in Miami (or who wants to live in Miami) that is a really awesome search engine marketer (3-5+ years experience) please send them my way! Really good salary and benefits, looking to hire the right person asap. Must be really nice because I don’t like to work with a-holes. Bonus points for runners, obviously. 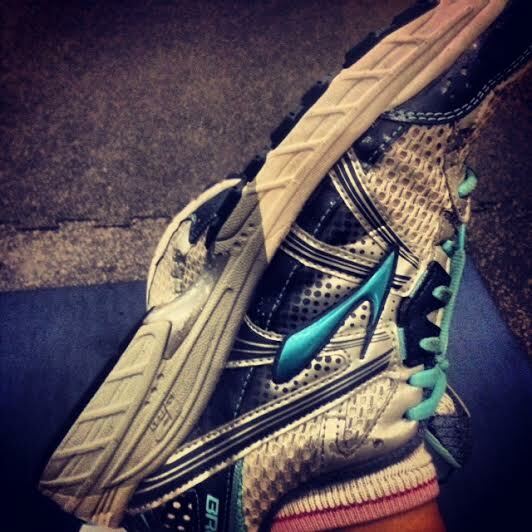 Do you keep your old running shoes? Back to work this week? Excited for the playoffs this weekend?! My Dolphins really stunk it up at the end and didn’t make it, but my backup team is the Packers… GO PACK GO! I hate giving up shoes too! It’s a sad sad day… just get another more fun pair! I love my Adrenalines and replaced them with the same exact pair 🙂 The latest version of the Adrenalines were just put out, so I was able to get the same model for only $89 instead of $110 from Running Warehouse! Donate your shoes to KindRunner!!! They give you points for new shoes and donate your old ones to the needy. Such a great organization. What new shoes will you be running in?? I have a pair of shoes that I just can’t get myself to give up. I think it’s because my replacement shoes haven’t been able to live up to the old ones. I believe it! Once you find a pair you love that work perfectly for you, just keep buying them again and again! I think I’ll wear Adrenalines for the rest of my life (or until Brooks changes them). I just ordered my third pair of Hoka’s so I’ll be retiring my first pair as soon as they arrive. It does make me kind of sad but I’ll just use them as walking shoes now. Ohh Hokas, interesting! I follow Dave Mackey’s running career and I know he runs in Hokas. I’ve heard such good things about them but I am afraid to try! I don’t keep old running shoes but I saved quite a few shoelaces. And just two days ago I threw away a bunch of those foil wraps I got after a couple marathons. It was my wrap from when I BQ’ed and then my actual wrap from Boston. But now 4 years later I finally threw them away. My shoes go like this: running shoes turn into weight lifting shoes then they turn into mow the grass shoes and then they get thrown out. Ohh that is a good process! I like it! Oh, it’s so sad when you have to retire a favorite pair of running shoes. I don’t usually keep them, but I have one pair that I just haven’t been able to let go because they are sooooooo comfortable, even though I know they’ve used up all their mileage. I’ve never found another pair that I love as much and, of course, Mizuno changed them so the new ones just aren’t the same.